I’ve said this before, but it bears repeating: when I was a kid, Mars was a dead planet. Dry, frozen, with hardly any atmosphere, I always figured it wasn’t very interesting. These before and after images (part of a trio of them) show the motion. The image on the left was taken June 30, 2007, and the one on the right in October of that year. 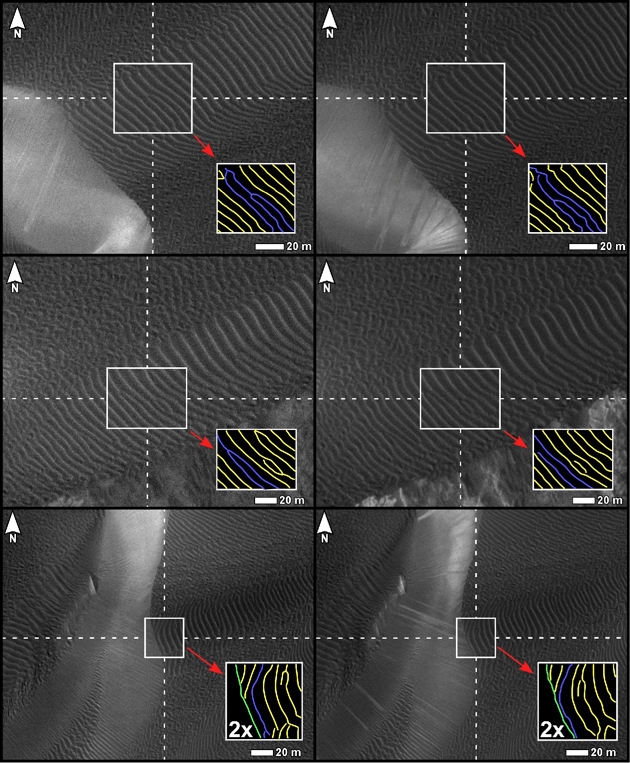 During that time, just a few months, the ripples can clearly be seen to have moved by a few meters (the inset diagram shows the ridges on the dunes schematically). This means that the wind blowing in this part of the planet is not only actively pushing around the sand, but also doing it on a timescale we can measure. And on a spatial scale, too. Note the scalebar in the images: it’s 20 meters long, about the size of a house! This strongly suggests that these dunes are loose piles of sand, and not heavily crusted over or cemented (the grains stuck together). That, plus the time and size of the migration, yields yet more clues about the way the surface of Mars is put together. Amazingly, this comes at the same time as other news showing that dunes in another region of Mars haven’t moved for at least 100,000 years, and possibly as long as three times that age! So while some regions of Mars are dynamic, active, and changing on a timescale of weeks, other regions are static, unchanging, and rigid for hundreds of millennia. I used to think Mars was uninteresting. I was dead wrong. Mars is weird, and in astronomy and space exploration, weird is always interesting.